We’d love your help. Let us know what’s wrong with this preview of Heart to Heart by Lois Ehlert. From beloved Caldecott Honor artist Lois Ehlert comes a clever and funny valentine celebrating love and friendship. Readers of all ages will go bananas for this pun-filled and sweet story filled with rebuses and love. Alphabet letters and bold, graphic images of fruits and vegetables come together in this endearing and playful book that is perfect for sharing. To ask other readers questions about Heart to Heart, please sign up. Text is full of puns and reads like spread after spread of picture puzzles as readers must decode letters, numbers, and images to move the story forward. Some of the playful wording is cute, most pages require a pause to figure out. Overall, though this has kid appeal due to the bright colors of the digital artwork, reading this independently will be very difficult for children without an adult's help. I could barely even finish it - it's typical Ehlert style, but it's written in.... basically text speak with food-related puns tossed in everywhere. The colors are highly contrasting, so as you stare at the page trying to figure out what the sentence means, your eyes start to cross. Definitely a miss from me. Not her best. Not "EZ" to follow. I'm a fan of Lois Ehlert's artwork and this book is no exception. I love all the play on words, my only complaint is the small size of the book. Chances of getting lost in the shuffle at a library is higher unfortunately. Pull this one out for sharing with elementary school kids around Valentine's Day. This cute little book would make a nice Valentine's Day gift for a little one. Not my favorite Ehlert, but it's heart is in the right place. Bright colors, some of the puns are funny, others not so much and one or two are not so easily figured out. Imagine my shock when I found that the author of the first book I learned to read....wrote another book!? Naturally, I loved this book before I even flipped the first page. The clever picture sentences were fun! Great color and shapes and sayings. My son loved figuring out the meanings with the fruits and vegetables sound a likes. Though not great when learning to read and using short cuts for words. But my four year old loved this book, so it was read a lot. Bright, solid colors with sharp lines on objects in here traditional style. Could not make myself finish this; I found myself struggling to figure out some of the puns, then I grew frustrated and then I gave up. Too busy right now to deal with this. Disappointed because I generally love Ehlert's books. Many of the puns were lame. Some rebuses don't fit the intended sound well, and sometimes pictures were labeled with the word because they were too difficult to guess. Library recommended picture book. Good for young kids who are starting to read using pictures. Word play...with visuals and vegetables! Clever wording with fruit and vegetable puns. It's a story with two voices "speaking" back and forth. Like this to use with Wumbers and possible when you talk about bon temps or autographing yearbooks. The illustrations in this book contribute to several plays on words in the text which can be fun to read out loud. The colors, however, can be hard because there isn't much of a contrast between the background and illustrations in some cases. I like the small size of this one. It's filled with puns and is cute, but doesn't have a lot of substance. Silly puns! It's not really a story, but it's cute. Wish I could give it a 2.5: somewhere between ok and liked it. Darling...a gem of a book! Sweet little book by Lois Ehlert - using fruits and vegetables to convey a message of love. Young readers will have fun with the wordplay and the artwork is distinctive! Cute book. I love how she uses different foods for words. Who doesn't love a little mystery or a puzzle to solve? Secret code books have consistently been popular titles in the nonfiction section of school libraries. Students are amazing in their ability to discover answers because they think outside the box without the constraints adults seem to acquire. Not only do they like to decipher problems, especially if they can be seen as a game or quest, but they like to create them for someone else to figure out. Queen of colorful collage illustrations, Cald Who doesn't love a little mystery or a puzzle to solve? Secret code books have consistently been popular titles in the nonfiction section of school libraries. Students are amazing in their ability to discover answers because they think outside the box without the constraints adults seem to acquire. Not only do they like to decipher problems, especially if they can be seen as a game or quest, but they like to create them for someone else to figure out. 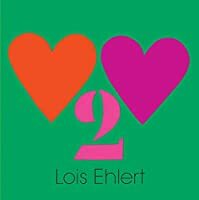 Queen of colorful collage illustrations, Caldecott Honor winner for Color Zoo, and maker of marvelous titles for the very youngest readers, Lois Ehlert, has a new book. Heart to Heart (Beach Lane Books, an imprint of Simon & Schuster Children's Publishing Division, January 3, 2016) is like holding happiness in your hands. Its cleverness is cozy and comfortable; a rebus brimming with puns. Ehlert makes a picture book entirely from rebuses and puns that is completely endearing. Filled with the same bright graphics as the cover, this picture book is a small square size perfect for a gift or for little hands. Various fruits and vegetables make appearances in the puns, adding a yummy twist. The simple premise of the book gets challenging unless you read the riddles out loud. Suddenly turnips and beans make sense in the sentences and everyone is sure to smile when the sentence is decode Ehlert makes a picture book entirely from rebuses and puns that is completely endearing. Filled with the same bright graphics as the cover, this picture book is a small square size perfect for a gift or for little hands. Various fruits and vegetables make appearances in the puns, adding a yummy twist. The simple premise of the book gets challenging unless you read the riddles out loud. Suddenly turnips and beans make sense in the sentences and everyone is sure to smile when the sentence is decoded. The playfulness here is as bright as the colors used in the illustrations. Written in letters, numbers, shapes and puns this little book by Lois Ehlert is a fun and fantastic love letter written to who every reads it. The pages are simple and spare, but can give a child just learning to recognizes numbers and letters and opportunity to have success in reading. I would give this book to any preschool child who needs a little boost in their reading skills and watch them get excited as they start to decipher what is on the pages. I absolutely love this clever play on the "check yes or no " part of love. Lois uses vibrant colors and wonderful imagery to convey a heart warming question about love. It's a super cute quick read that would be perfect for the school aged set.